Be the first to share your favorite memory, photo or story of Eldean . This memorial page is dedicated for family, friends and future generations to celebrate the life of their loved one. 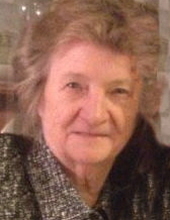 Mrs. Eldean White Wheat, 83, of Richmond, passed away Monday, January 28, 2019 at Madison Health & Rehabilitation. Mrs. Wheat, the daughter of the late Bartie Shanks and Bernice Lowery Shanks, was born in Madison County on July 16, 1935. She retired as a Night Supervisor at EKU. She loved to go to church and was a member of High Point Apostolic Church in Winchester. She enjoyed traveling with her sisters and going to the ocean. Funeral Services will be conducted at 10:30 AM Saturday, February 2, 2019 at Combs, Parsons & Collins Funeral Home with Rev. Barney Bates officiating. Burial will follow in the Richmond Cemetery. Visitation will be from 5:00 PM – 9:00 PM Friday at the funeral home. "Email Address" would like to share the life celebration of Eldean White Wheat. Click on the "link" to go to share a favorite memory or leave a condolence message for the family.